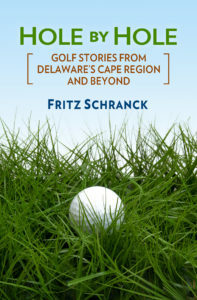 A select group of accomplished Cape Region golfers participated in this year’s Delaware Amateur or the Delaware Women’s Amateur golf tournaments. Sponsored by the Delaware State Golf Association and the Delaware Women’s Golf Association respectively, these are two of the most prestigious golf competitions in Delaware, in addition to the upcoming Delaware Open, to be held July 30-31 at DuPont Country Club in Wilmington. Emma Sills and Luanne Zabytko of Kings Creek Country Club played in the Women’s Amateur. Elise Coar, Perry Drevo, and Suzanne Moore, members of Rehoboth Beach Country Club, also participated. Other Cape Region golfers in the Women’s Open included Kim Thomas of Bayside, Pat Sernyak of Baywood Greens, and Sandy Sciitti of Ocean City Golf Club. Several local golfers played well in the Delaware Amateur, and also qualified to play in the upcoming Delaware Open, such as Chase Brockstedt of Kings Creek CC, along with Ed Brown and Clinton Bunting of Rehoboth Beach CC. Tim Freeh of The Rookery and Wesley Hood of Lewes will also be playing in the Open. Other Cape Region amateurs competed in the Amateur, but at this point have not qualified for the Open. These include Steven Harvey of Rehoboth Beach CC, Ty Mayers of Kings Creek CC, Joshua Mohun of Baywood Greens, and Miguel Lopez of The Rookery. Several Cape Region golf professionals will play in the Open. These include Troy Flateau, John R. Lynch, Michael Neider, and Phil Ortiz of The Peninsula, Kevin Weist of Kings Creek CC, Michael Rushin of Baywood Greens, and Zac Oakley of The Rookery. Apparently it has been a while, but someone finally had a hole in one at the Old Landing Golf Course. Butch Campbell of Newark enjoyed his visit to the Cape Region, topped off this past week with an ace on the 122-yard par 3 ninth hole. Campbell reportedly used a Ping wedge for his shot. Sheila, the longtime pro shop staffer at Old Landing, didn’t think anyone had an ace on the course during all of last year, and she said Campbell had the first one for 2012. Note the quotation marks in the above paragraph. That wasn’t me saying those words–those are the genuine words used by an actual golf apparel company. Because of their assessment, Ashworth sent me one of their new EZ-TEC2 golf shirts. They requested me to test and report back to them-and to you, dear readers. Testing freebies is just one of the many sacrifices golf writers make for their reading audiences, and you’re very welcome. I tried out my new shirt, a tasteful grey striped number, during a recent failed attempt to win a round in the annual Shawnee Cup match play competition. I hasten to note that my failure to win the match had nothing to do with the shirt. Despite the heat and humidity, the breezes helped the shirt wick away “moisture”, just as advertised. The shirt remained mostly dry through the entire 18 holes, in stark contrast to the usual soaked-through condition of the regular cotton tops I wear. It also has a very pleasant soft feel, and would look fine off the course as well. Ask your local golf pro or check your local golf shop, or check these shirts out at Ashworthgolf.com. The Kings Creek Ladies 9 hole group played a straightforward low net competition July 23, a rarity for a bunch that enjoys playing a variety of formats. Chris Sullivan won first place, followed by Celia Martin in second and Kathy Nave in third place. Nave also won the day’s closest to the pin competition on the sixteenth hole, with a shot finishing 4 feet 2 inches from the hole.